Councillor Davie Paterson in Howegate in Hawick. A potholed Hawick road regularly having work carried out to patch previous patches is now in need of an urgent overhaul, council bosses have been told. Some parts of the road at Howegate have been patched up three times as the condition of the surface continues to deteriorate. Cash-strapped Scottish Borders Council simply doesn’t have the funds to relay all the damaged roads in the region and adopts a priority approach to carry out work on those deemed to be worst affected, and Howegate has failed to get onto that list thus far. Hawick and Hermitage councillor Davie Paterson believes that, because of its poor condition and central location, Howegate should be near the top of the list, however. At constituency surgeries he often hears Howegate residents complaining about the road surface’s poor condition. He said: “It’s been going on for months. “What folks are saying now is they are are patching the patching and some parts of the road have been patched two or three times. “I’ve been trying to get the message across how dangerous that road is, and I’ll keep highlighting it until action is taken. “It’s about a 50-metre stretch and it’s a very, very busy road and needs to be sorted out because other roads have been getting attention. “I’d like to see the whole stretch of Howegate relaid as a matter of urgency. Mr Paterson has also written to Amey, the infrastructure support service, raising concerns about the state of the road. 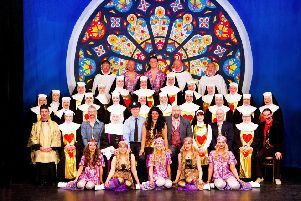 Review: Sister Act at Innerleithen – not to be missed! A council spokesperson said: “The council’s resurfacing programme for 2019-2020 has yet to be finalised, and the Howegate will be considered for possible inclusion alongside other identified sections of road. “The council has almost 3,000 kilometres of road to maintain across the Borders. “Every year, we compile a planned surface treatment works programme from our record of sections of road which need treatment.